The swearing-in ceremony for Theodore Roosevelt’s second inauguration took place March 4, 1905 on the East Portico of the U.S. Capitol. It was a sunny but exceptionally blustery day, with strong northwest winds whipping throughout the ceremony and the three-and-a-half hour parade that followed down Pennsylvania Avenue. Coat tails, capes, flags and banners were in constant motion. TR’s address lasted about six minutes but few heard the entirety, as the blowing gale casually tossed his words in every direction. Flapping along with every other fabric that day was this “Roosevelt/Fairbanks/1905” ribbon and its accompanying inaugural souvenir button, probably sold by a street vendor. Both the artist and button-making company remain unknown to this day. By now, we’re used to seeing the donkey and elephant as the respective political symbols of the Democrat and Republican parties. Renowned political cartoonist Thomas Nast generally is credited with being the first to make this link in his 1870s cartoons. This 1905 inaugural souvenir button stands out because it appears to represent the first time both symbols, in cartoon form, appear on a single political device designed to be worn. Both symbols saw increasing use as party mascots in cartoons and on paper items in the 1880s; however, their use on objects to be worn evolved much more slowly. The earliest elephant I’m aware of appears on this 1888 Benjamin Harrison “Reception Committee” ribbon badge. 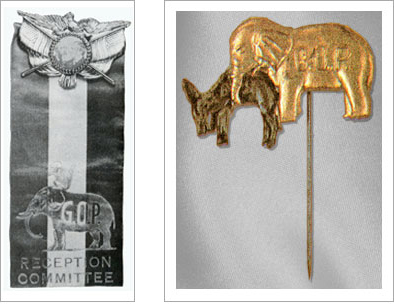 The first I’ve seen to combine donkey and elephant is this embossed brass stickpin for McKinley, from either his 1896 or 1900 campaign, showing a realistic, non-cartoon, elephant with “G.O.P.” on its side and its trunk around the mid-section of a limp, dangling donkey. While the pin-back button, invented in 1896 by Whitehead & Hoag of Newark, NJ, became commonplace in politics from 1896 on, I believe this 1905 cartoon of the victorious, dancing elephant dangling by the tail his diminutive, defeated, and dead donkey opponent is the first to display both symbols on a single pin-back button. Ted Hake is a TRA trustee and founder of Hake's Americana & Collectibles Auctions in York, PA.